Endowed with supernatural powers after an encounter with celestial beings on the first-ever manned mission to Mars, Adam Archer is the only human being in existence to glimpse universal enlightenment. In GØDLAND, Joe Casey’s and Tom’s Scioli’s trippy, psychedelic spin on the Kirby tradition, Archer has returned to Earth and, along with his four sisters, protects it from threats from the cosmos. The final volume of the series, GØDLAND VOLUME 6: GØØDBYE DIVINE, will answer the question posed from the beginning: Can he truly become one with the Universe? Throughout the series, Archer has battled robot zombies, villains in search of the ultimate high, the sadist Discordia, and sibling rivalry. He has encountered a god-like being called Iboga and been guided by a wise dog-like alien named Maxim. But throughout it all, it’s unclear if, as a human, Archer has the potential to achieve what his brush with infinity makes possible. The job of illustrating such a far-ranging and idiosyncratic work falls into capable hands with Scioli, whose bold character designs, celestial landscapes, and eye-popping color bring the vast universe of the co-creators' shared imagination to life. GØDLAND VOLUME 6: GØØDBYE DIVINE will be in comic book stores on June 11 and bookstores on June 24. A new printing of the Eisner-Award-nominated hardcover GØDLAND: THE CELESTIAL EDITION VOLUME 1, which collects issues #1-12 of the series will be in stores the following week, and THE CELESTIAL EDITION VOLUME 2, collecting #13-24 is also available. “Joe Casey and Tom Scioli are publishing a tribute to Jack Kirby and Steve Englehart, without mimicking the greatness set forth by those creators. At the same time, this book doesn’t slavishly plod forward solely as tribute, but it offers a story that is odd, fun, and amazing. 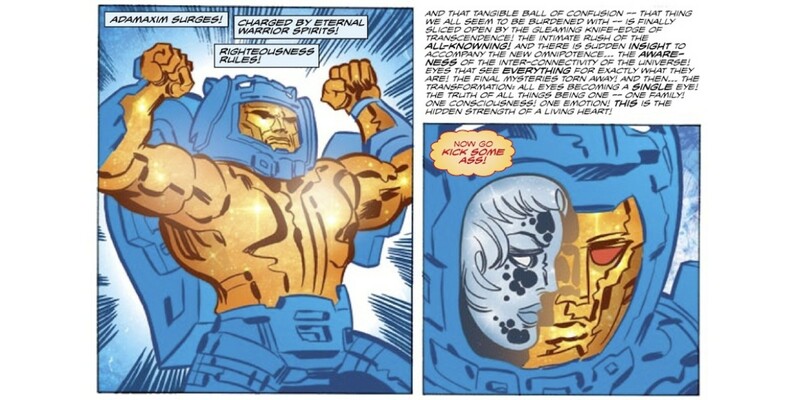 Scioli’s art is so Kirbyriffic that neophytes to the world of comics might easily mistake this work of some of Kirby’s, albeit less refined than his, and significantly more playful. Like those comics of old… Gødland is pulsating with cosmic energy that strains to pop from the page. Man of Action Entertainment, the creative studio and writers collective started in 2000, created the megahit Ben 10, a three billion dollar boys' action empire that has been called the most successful superhero launch of the past decade. Man of Action Entertainment is comprised of creators and acclaimed comic book writers Joe Casey, Joe Kelly, Duncan Rouleau and Steven T. Seagle, having collectively worked on the largest franchise characters in comics from Superman to X-Men before refocusing on creating worlds and characters for their own original work published through their Man of Action imprint at Image Comics. They also created cult favorite series Generator Rex for Cartoon Network, are co-executive producers and writers for Marvel's Avengers Assemble and executive produced/wrote Ultimate Spider-Man on Disney XD. Upcoming films based upon Man of Action creations include New Line's The Great Unknown, Officer Downe and Big Hero 6, announced as Disney's first animated feature based on a Marvel property featuring the team of characters created by Manof Action.